Missed my previous review? Find it here! Nino and the band perform at the school music festival. Nino has been in a funk for the past several weeks and the band is worried that Nino will ruin the performance. Yuzu, in an attempt to break Nino’s depression, uses one of Momo’s melodies to write her a new song to sing on stage. She is inspired by the song and sings her best performance ever. She remembers her reason for singing and renews her vow to use her voice to reach the world and touch Momo. After the smashing success at the concert, the band goes out to celebrate. Ayumi goes home to the apartment he shares with his brother and sister in law. Still amped up from the show, he has an outburst when his sister in law comes out in her nightgown and treats Ayumi like a kid brother. He confesses his love to his sister-in-law and almost kisses her but stops moments before and runs out of the house. He goes to fellow bandmate Haruyoshi and asks to stay the night. Haruyoshi announces that he has signed the band up for a small concert tour in several prominent cities. Yuzu has been tasked with writing the band’s new hit single for the summer, while Nino must prove her worth by writing the lyrics for a smaller side gig involving two models. The story promises new layers of drama and turmoil with the addition of new characters and new motivations and a change of scenery for the band. Expect more of the same from the next installment of Anonymous Noise. Author Ryoko Fukuyama is consistent, if anything else. I think the art scenes from the concerts has really improved and there are some excellent action shots of the bands. The artwork shows a lot of energy and emotion in a way that’s not too over the top for a manga about musicians. While I really liked the attempt of expanding Nino, Momo, and Yuzu’s back stories, I had a few problems with the way things were ultimately laid out. I’m always one for having complex characters with some hidden back story motives, but in order for those types of characters to work, the execution has to be spot on. The attempt was there to give Yuzu and Momo very different motivations for wanting Nino, but the reasons felt a bit forced and arbitrary. A bit like the author was saying “See! They do care about her, even though they’re assholes to her.” I grew a bit bored with the teary eyed confessions of love and Momo and Yuzu still treating Nino as a prize to be won and owned. Several times Yuzu and Momo both make declarations about having Nino all to themselves and never sharing her talent with others. Yuzu grows jealous of Nino singing one of Momo’s songs, even though he’s the one who asked her to sing it. Very healthy relationships. I am still having a bit of a hard time following the transitions between characters and stories. The characters are all drawn so similarly that I can’t tell who is speaking to whom or where the story is taking place. I had to reread a couple scenes before I figured out that Yuzu’s mother was the one giving him an ultimatum to quit music for good. There was also a third love triangle/relationship drama story thrown in this volume. One of the band members, and president of the music club, Ayumi, gets embroiled in a crush on his brother’s wife, who he lives with. I had a hard time figuring out how this all fit in with the story except to add a little backstory to the other band members and adding layers and layers of drama to an already bogged down story. I would have rather seen more of Nino’s ‘rival’ Miou, the talented singer that Momo has chosen as the lead singer of his band. That story felt like it had more connection and room for character growth than a young teenage boy pining over his brother’s wife. We’ll see where this story goes. I was also a little confused with the foreshadowing at the very end of the volume. The ominous appearance of the two models who want Nino to write a song for them seems to be leading to yet another layer of jealousy and angsty motivation to the group. 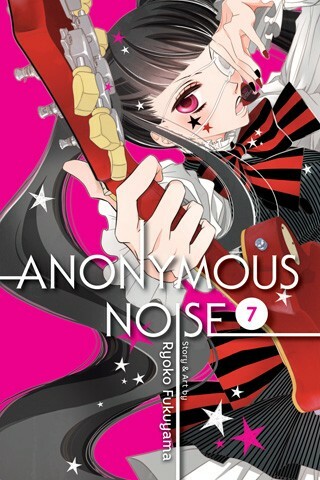 We’ll see where the story ends up in the next volume of Anonymous Noise! Want to read Volume 7? Find it here! Viz Media provided us with a copy of this manga in return for a fair review.